What type of massage therapy is best for you? Massage therapy is a healing art that utilizes the manipulation of soft tissues to improve health and well-being. Regular massage not only soothes muscles, but improves the body’s circulation and lymphatic flow while stimulating the nervous and immune systems. Sports massage therapy is geared toward athletes of every kind, from world-class professionals to weekend joggers. The particulars of this style of massage are specific to the athlete’s sport of choice. Focusing on areas of the body that are overused and stressed from repetitive and often aggressive movements. Aspects of sports massage therapy are gaining popularity as useful components in a balanced training regimen. Athletes have discovered that specially designed massage promotes flexibility, reduces fatigue and improves endurance. Massage also prevents injuries while preparing their body and mind for optimal performance. One of the key benefits of Sports massage therapy compared to other modalities is its ability to target muscle-tendon junctions. A 2010 study in the journal of Strength and Conditioning Research found that a 30-second massage improved hip-flexor range of motion. A full-body massage indicates that the therapist will massage your whole body during a therapeutic massage lasting at least 50 minutes. That’s the amount of time needed to massage all the major areas of your body — back, shoulders, legs, feet, arms, hands and neck. 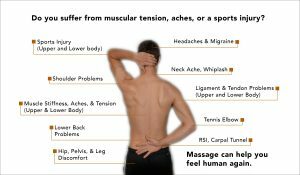 If you have problem areas but don’t want other areas to be shortchanged, make an appointment for a longer massage session, such as 90 minutes. That way you can get a full body massage along with the more focused work you need in specific areas. Tension can be caused just by sitting at a desk or in a car for long periods of time. Myofascial and Deep Tissue therapy targets muscles and relieves tension and pressure, keeping your joints more fluid. This is accomplished by applying gentle, sustained pressure to the body’s connective tissue. Swedish massage therapy is the modality that comes to mind when most people think about massage. It is the best-known type of bodywork performed today. One of the primary goals of this massage technique is to relax the entire body while promoting circulation. This is accomplished by rubbing the muscles with long gliding strokes in the direction of blood returning to the heart. This style of massage therapy goes beyond relaxation. This modality is exceptionally beneficial for our bodies. It increases the level of oxygen in the blood, decreases muscle toxins, improves circulation and flexibility while easing tension. A study was conducted by the National Center for Complementary and Alternative Medicine, and published in The New York Times. The results found that volunteers who received a 45-minute Swedish massage experienced significant decreases in levels of the stress hormone cortisol, as well as arginine vasopressin-a hormone that can lead to increases in cortisol. Volunteers also had increases in the number of lymphocytes, white blood cells that are part of the immune system. This caused a boost in the immune cells which could help fight colds and the flu. Swedish massage techniques include circular pressure applied by the hands and palms, firm kneading, percussion-like tapping, bending and stretching. Before and during your massage session, communication is encouraged with your professional massage therapist. We will adapt your session so that your massage is customized to your specific needs. Deep tissue massage therapy is similar to Swedish massage, but the deeper pressure is beneficial in releasing chronic muscle tension. Slow steady strokes and deep pressure are used to work deep into the muscle and connective tissue. This will cause a release specific muscle tension while restoring flexibility. A study in the Journal of Alternative and Complementary Medicine (*Dynasty Medical Care) found that people’s blood pressure fell after a single 45 to 60-minute deep tissue massage. Additionally, a 2010 meta-analysis in the Journal of Clinical Psychiatry found that massage modalities like deep tissue reduce stress hormone levels and heart rate while boosting mood and relaxation by triggering the release of OxyContin and serotonin. Deep Tissue work is great for those who want to release acute and chronic tension. Tension which may have developed from overuse or injury. It’s great for athletes or anyone who loves to play hard! Myofascial release (MFR) also known as Connective Tissue Therapy, is an alternative medicine therapy that claims to treat skeletal muscle immobility and pain by relaxing contracted muscles, improving blood and lymphatic circulation, and stimulating the stretch reflex in muscles. Fascia is a thin, tough, elastic type of connective tissue that wraps most structures within the human body, including muscle. Fascia supports and protects these structures. Osteopathic theory proposes that this soft tissue can become restricted due to psychogenic disease, overuse, trauma, infectious agents, or inactivity. This often results in pain, muscle tension, and corresponding diminished blood flow. Integrative Massage incorporates several massage styles in the course of a single session for a dynamic and transformational healing massage. I take time to personally consult with each client to review individual needs, present/past injuries, and bodywork preferences for each massage session. My goal is to help every client relieve stress and regain balance. Set up an appointment with us to begin your healing process.